Nose: The very first whiff is very alcoholic – a bit of nail varnish, and quite sweet. The barley is quite strong on the nose of this one, along with some milk arrowroot biscuits, and a touch of burnt porridge. Some peat is there as well, but not what you’re expecting after reading the phenol count on the bottle! The absolute lightest touch of something citrus also makes itself known – a mix of lemon and lime essences. A slightly odd combination of sweet, bitter, and savoury on this nose. Palate: Found the peat! It might have been hiding on from the nose, but it sure isn’t shy when it comes to the tastebuds. Along with the massive whack of peat, there are some fairly normal Octomore notes on the palate – sweet honey and malt, a decent dose of sea salt, and the faintest traces of both dried apple, and some citrus notes. Perhaps a touch medicinal, but we’re talking levels that are lightyears from Laphroaig here. Give this whisky a bit of a rest in the glass, and a the medicinal notes mellow – not that they’re big to start off with; and a sweeter, creamier palate appears – with perhaps the slightest touches of mint and cocoa. Mouthfeel: A bit of an alcohol tingle, which shouldn’t surprise at this ABV, but is still unusual for Octomore – especially more recent releases. It’s quite thick and creamy as it coats the tongue – there’s a good heft to this whisky. Finish: Long. Seriously long. Full of peat. The finish is (perhaps unsurprisingly with the phenol count) extremely smokey, and strangely almost savoury – quite unusual really, but not in a bad way. Balance: I was going to say that if you ignore the nose, this whisky is extremely balanced, but that’s not entirely true – if you ignore the alcohol and nail varnish on the nose, then the whole whisky, nose included, is reasonably well balanced. The milk arrowroot and burnt porridge on the nose take a bit of a backseat through the palate, but are still sort of there with the savoury malty notes; and travel through to the finish. The faint citrus flavours are also present all the way through. The peat, which makes itself well and truly known through the rest of the whisky is present on the nose, but very subdued. Overall the balance is reasonable, but not superb. Octomore 6.3 has been aged for 5 years in Bruichladdich’s warehouses on the shores of Loch Indaal, on Islay. It was peated to a phenomenal 258ppm, and bottled at a rather rich 64%ABV with no colouring, and no chill-filtration. This is the first true Octomore of Octomore, with all of the barley that was malted for this whisky coming from James Brown’s Octomore farm – from the Lorgba field at Octomore farm to be precise. It’s not every whisky that you get to know the exact field, in the exact farm that the barley that was malted for the whisky was grown; but Bruichladdich is incredibly proud of their Islay Barley series that stretches across all three of their brands, Bruichladdich, Port Charlotte, and Octomore, and is not shy with releasing as much information as they can in regards to what goes in to those bottles. Bruichladdich has stated that it is a hard slog using barley from Islay – compared to other barley growing regions, the yield from most Islay barley is fairly low; and the weather and wildlife on the little island out in the Atlantic between the Scottish mainland and Ireland don’t exactly help matters. Bruichladdich have a fascination and an obsession with the provenance and terroir of their whiskies though, and the results have spoken for themselves. 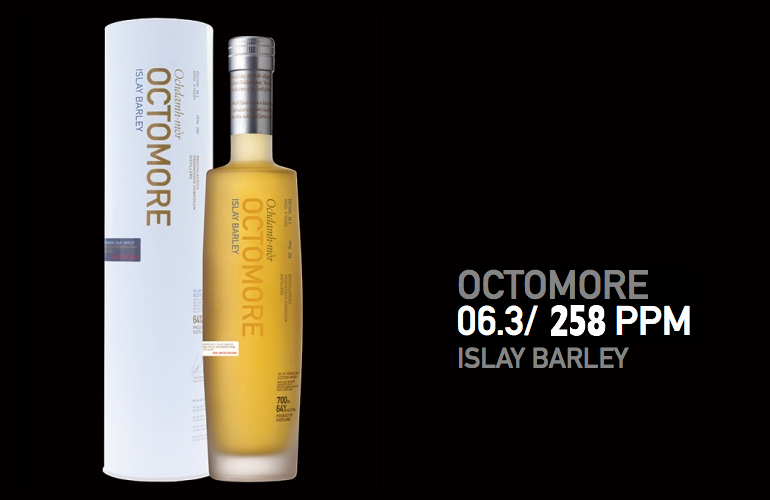 Along with not just being a single vintage, single region, single farm, but a single field malt, Octomore 6.3 is also rather notable for one other aspect, and that is the fact that the barley for this whisky was peated by Baird’s in Inverness to an earth-shattering 258 phenol parts per million – 89ppm more than the previously heaviest peated whisky, Octomore 5.1, which was peated to 169ppm. A lot of the peat is lost in the distillation process, and I believe that Bruichladdich’s tall narrow stills, and super slow ‘trickle distillation’ strip back more than many others; but there is no denying that there is an almighty amount of peat to slap you around with on the palate of this whisky. The peat’s presence on the palate and the finish is big and bold, and holds no prisoners. This whisky is not quite as refined as many of the more recent Octomore editions, bringing some rougher edges that are a little reminiscent of Octomore 1.1 – and in many ways this whisky is a first edition; it is the first Octomore Islay Barley. There are some similarities with Bruichladdich’s other Islay barley releases – the soft malty, biscuity notes; the lusciously thick, almost chewy, mouthfeel, and the finish that just doesn’t want to end. Bruichladdich has obviously learnt a lot over the previous generations of Octomore, so it is much more refined than the 1.1 edition was, but at times you still feel like they’ve only just managed to tame this whisky – and as an essentially first-and-a-half whisky, that is perfectly alright. Jim McEwan and Adam Hannett were obviously paying close attention though because one generation later in the Octomore Islay Barley releases came my favourite whisky of all time, the Octomore 7.3. A big, boisterous whisky with a few rough edges, the Octomore 6.3 is an important step in the evolution of Bruichladdich’s quest for the ultimate statement in provenance and terroir in whisky, and is definitely worth trying if you can get your hands on a bottle, or even just a dram.